Mountain bike off-the-beaten track while exploring rural areas around PV, back roads, creeks, small country villages, and open fields. Or for those riders in top physical condition, choose more challenging options such as heading straight up the Sierra Madre mountains on old mining roads. From beginners to advanced riders, there is a tour offering designed just for you. 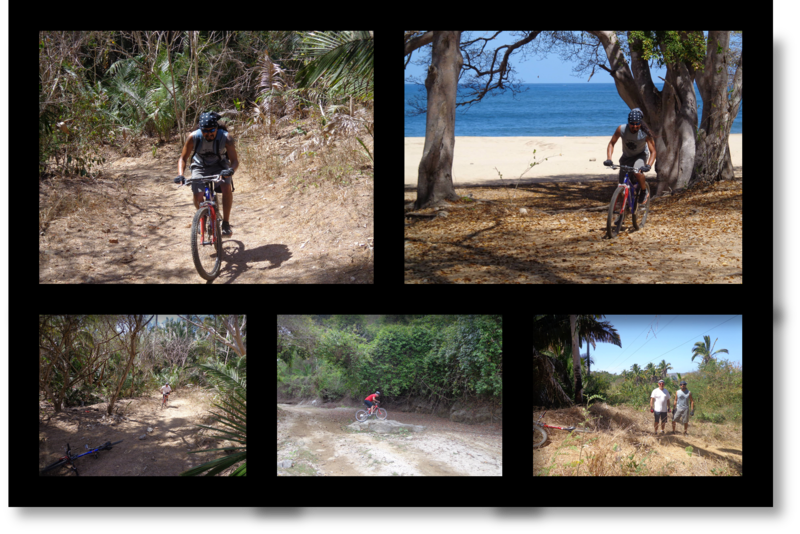 Above are photos of BeachOceanSun’s hubby and his friend Jaime mountain biking on their own in Sayulita, Mexico. This Specialized Bike shop is located in the Galerias Vallarta Mall in Puerto Vallarta. You can stop by the store and inquire about joining the next informal bike tour that they organize on Saturday mornings with local cyclists and their own employees just for fun. You can also arrange to rent a mountain bike from them if you are joining in on their group’s ride. The rugged jungle and mountain trails they take are definitely not for beginners. The rides are hard, exiting and very intense. This is an excellent operator that focuses on offering great mountain biking tours at reasonable prices. Their diverse bike tours include: Vallejo, San Pedro, El Salto Waterfall, Yelapa and Piedra Grande. Although they primarily cater to intermediate riders, tours range from all-levels to advanced to expert. 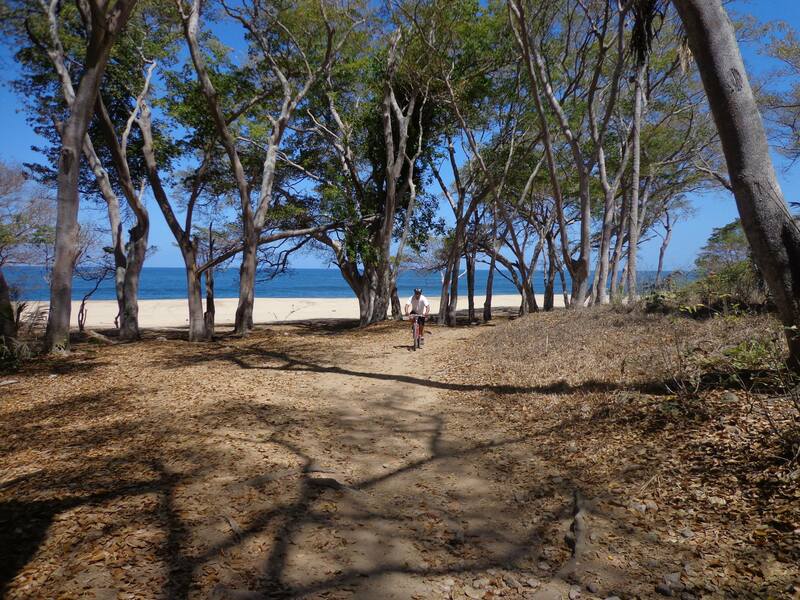 Eco Ride offers the best mountain biking tour options in the Puerto Vallarta area. Family-owned and operated business that structures their mountain biking tours around the specific desires and skill levels of each individual client, from beginning levels to advanced. For over 10 years this business operated as Vallarta Bikes, but has since expanded to include surf lessons and hiking, thus they are now more appropriately named Vallarta Expeditions. Be of legal age and have identification IFE, passport or license. Rental fees are payable at the time of pick-up or delivery of the bike. A $200 pesos per bike security deposit is required. It is the renter’s responsibility to take proper care of the bike and return it in good condition. If you’re looking to rent bikes, this is the place! Bicita Vallarta is located just down from Starbucks at the beginning (north end) of the Malecon. All bicycle rentals include a helmet. Bicycle delivery and pick-up are available for a nominal fee. They will even deliver to Nuevo Vallarta. Extras rental items include: chairs for baby, conveyor rack, lights, and basic tool kit. There is an organized bike ride every Wednesday evening which requires a nominal registration fee to participate.